The Quechua are a group of indigenous South American tribes, comprising the Quechumaran linguistic stock and living mostly in Bolivia, Peru, and Ecuador. 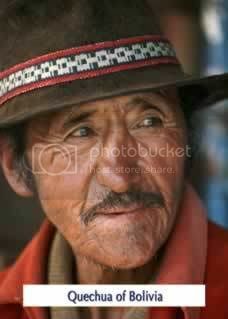 As direct descendants of the ancient and highly civilized Incan Empire, they are reserved and dignified. Their well-developed society survived the destruction brought by the conquering Spaniards. They were oppressed by the Spanish for centuries after the demise of their empire. Culturally and linguistically, the Quechua are related to the Aymara, a people group from the same regions of South America. The Quechua live in constant fear of their gods. They believe that in order to appease Pachamama, the Earth Mother spirit, they must make some form of sacrifice such as an animal sacrifice or the pouring out of alcohol on the ground. Otherwise, misfortunes may happen to them or their families. Punishments, they believe, come in the form of accidents, bad luck, sickness, or bad weather. Quechua miners give offerings to Tio, a devil god whom they believe controls events in the mine, and Awiche, an old woman whom they believe protects them from mining accidents. Bible portions have been translated in the Quechua language since 1907. In 1985, the New Testament translation was completed. In 1993, a translation of the entire Quechua Bible was printed.